A workflow task is a unit of work decorated with data and logic that allows it to be included and run within a workflow. Tasks can be defined to do wide-ranging operations, such as bootstrap a server node into a Linux microkernel, parse data for matches against a rule, and others. The tasks in a workflow are run in a specific order. A task definition contains the basic description of the task. It contains the following fields. injectableName String Required A unique name used by the system and the API to refer to the task. implementsTask String Required The injectableName of the base task. optionsSchema Object/ String Optional The JSON schema for the task’s options, see Options Schema for detail. options Object Required Key value pairs that are passed in as options to the job. Values required by a job may be defined in the task definition or overridden by options in a graph definition. properties Object Required JSON defining any relevant metadata or tagging for the task. Below is a sample task definition in JSON for an Ubuntu installer. A Base Task Definition outlines validation requirements (an interface) and a common job to be used for a certain class of tasks. Base Task Definitions exist to provide strict and standardized validation schemas for graphs, and to improve code re-use and modularity. The following table describes the fields of a Base Task Definition. friendlyName String Required A human-readable name for the task. optionsSchema Object/ String Optional The JSON schema for the job’s options, see Options Schema for detail. requiredOptions Object Required Required option values to be set in a task definition implementing the base task. requiredProperties Object Required JSON defining required properties that need to exist in other tasks in a graph in order for this task to be able to be run successfully. properties Object Required JSON defining any relevant metadata or tagging for the task. 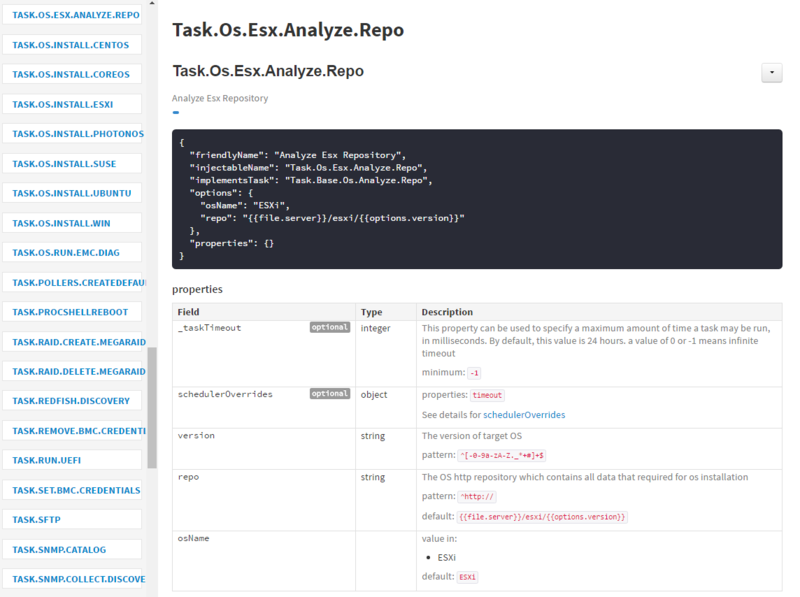 This metadata is merged with any properties defined in task definitions that implement the base task. This base task is a generic Install OS task. It runs the job named Job.Os.Install and specifies that this job requires the option ‘profile’. As a result, any task definition using the Install OS base task must provide at least these options to the OS installer job. These options are utilized by logic in the job. The primary difference between the Install CoreOS task and the Install Ubuntu task is the profile value, which is the ipxe template that specifies the installer images that an installation target should download. The Options Schema is a JSON-Schema file or object that outlines the attributes and validation requirement for all options of a task or job. It provides standardized and declarative way to annotate task/job options. It offloads job’s validation work and brings benefit to the upfront validation for graph input options. There are totally 3 kinds of options schema: Common options schema, Base Task options schema and Task options schema. The Common options schema is to describe all those common options that are shared by all tasks, such as _taskTimeout , the common options schema is defined in the file ‘https://github.com/RackHD/on-tasks/blob/master/lib/task-data/schemas/common-task-options.json’. User doesn’t have to explicitly define the common schema in Task or Base Task definition, it is default enabled for every task. The schema in Base Task definition is to describe the options of the corresponding job. The schema in Task definition is to describe the options of corresponding task. Since a Task defintion will always link to a Base Task, so the task’s schema will automatically inherit the Base Task’s schema during validation. So in practice, usually the task schema only needs to describe those options that are not covered in Base Task. NOTE: The options schema is always optional for Task definition and Base Task definition. If options schema is not defined, that means user gives up the upfront options validation before running a TaskGraph. Built-in Schema <Object>: Directly put the full JSON schema content into the Task and Base Task definition. Schema File Reference <String>: Specify the file name of a JSON file, the JSON file is a valid JSON schema and it must be placed in the folder ‘https://github.com/RackHD/on-tasks/tree/master/lib/task-data/schemas’. The Built-in Schema is usually used when there is few options or for situation that is not suitable to use file reference, such as within skupack. The File Reference schema is usually used when there are plents of options or to share schema between Task and Base Task. "message": "Task.Os.Install.CentOS: JSON schema validation failed - data should have required property 'version'"
Below is the message if the input uid beyond the allowed range. "message": "Task.Os.Install.CentOS: JSON schema validation failed - data.users.uid should be >= 500"
"message": "Task.Os.Install.CentOS: JSON schema validation failed - data.rootPassword should be string"
There are some values that may be needed in a task definition which are not known in advance. In some cases, it is also more convenient to use placeholder values in a task definition than literal values. In these cases, a simple template rendering syntax can be used in task definitions. Rendering is also useful in places where two or more tasks need to use the same value (e.g. options.file), but it cannot be hardcoded ahead of time. This refers to the shared context object that all tasks in a graph have R/W access to. Enables one task to use values produced by another at runtime. sku This refers to the SKU configuration data fetched from a SKUs. This field is added automatically if a SKU configuration exists in the the SKUs, rather than being specified by a user. env This refers to the environment configuration data retrieved from the environment database collection.Similar to sku, this field is added automatically, rather than specified by a user. Task templates also expand the capabilities of Mustache templating by adding the additional capabilities of Fallback Rendering and Nested Rendering, as documented below. This task makes use of both template conditionals and iterators to generate a sequence of shell commands based on the options the task is created with. "sudo /opt/MegaRAID/storcli/storcli64 /c0/vall del force"
"sudo /opt/MegaRAID/storcli/storcli64 /c0/v0 del force;sudo /opt/MegaRAID/storcli/storcli64 /c0/v1 del force;sudo /opt/MegaRAID/storcli/storcli64 /c0/v2 del force;"
In the task options object, a magic value _taskTimeout can be used to specify a maximum amount of time a task may be run, in milliseconds. By default, this value is equal to 24 hours. To specify an infinite timeout, a value of 0 or -1 may be used. If a task times out, it will cancel itself with a timeout error, and the task state in the database will equal “timeout”. The workflow engine will treat a task timeout as a failure and handle graph execution according to whether any other tasks handle a timeout exit value. The RackHD Task Annotation is a schema for validating running tasks in the RackHD workflow engine, and is also used to provide self-hosted task documentation. Our build processes generate the files for this documentation. You can access it via http(s)://<server>:<port>/taskdoc, when on-http service is running.